Greetings from the new board! We’re all very excited to be moving forward with a new, young (at heart) and energetic board! You can meet all of us and read a little about us at this link. The minutes of the ISA Membership Meeting can be found at this link, including reports on financials. We’re looking forward to an exciting year! We will be in contact with all of our members soon, so keep an eye out for an email from us soon. The new board is in the process of defining its plans for the next three years. One of our first goals is to connect with our members, explain the plan of the board and how we can all work together to achieve our mission, a world that understands stuttering! We will be reaching out to all of our advisory board members soon, to introduce ourselves and to lay out our work plan for the next three years. The ISA is working with the International Fluency Association and the International Cluttering Association to hold a joint World Congress in Hiroshima! The team has already held its first organising meeting which was very positive, with a focus on inclusiveness of the needs of all participants. We will keep you informed with key decisions are made. It’s hard to believe it’s already less than two years away. There’s a lot to do and not much time. The ISA Membership Meeting also agreed to hold its triennial World Congress for People Who Stutter in Iceland in 2019! Many of the same working group involved in the World Congress 2018 are involved in the planning group for this event, to keep consistency, share knowledge and reduce duplication. The first meeting of the planning group will be held soon. The theme is set: Stuttering Pride: Respect. Dignity. Recognition. 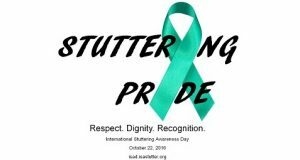 The International Stuttering Awareness Day Online Conference team has put together three short videos promoting stuttering awareness and the theme for this year’s International Stuttering Awareness Day theme and we are still looking for contributions! Please contribute a short story, video or even picture. See isad.isastutter.org for the full requirements for submissions to the online conference. Strengthening our communications with members. Active planning of the two World Congresses, the first meeting of the 2018 World Congress has already been held with ISA participation. Establishing clear methods of communication with other board members, with an intent to meet each month to discuss the business of the ISA. We, and the whole board, are looking forward to an exciting three years of great work, extending the reach and influence of the ISA, collaborating with members and working towards our vision, a world that understands stuttering.